Pictured is a person drawing out a brainstorming session for their team of workers. Brainstorms are an effective way of getting multiple ideas down on paper and work when teamwork is involved. Coloured post it notes and paper clips can also be seen in this image, giving it more creativity and representing a strong brainstorming session with lots of ideas channelled into it. 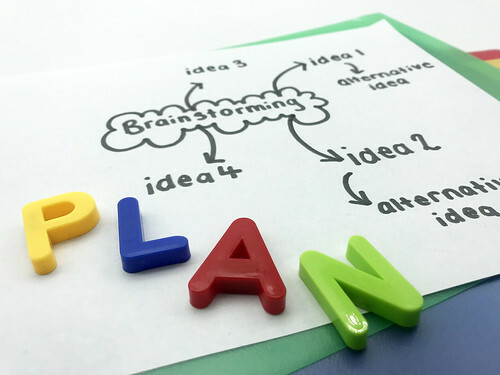 The word 'plan' is also spelled out in multicoloured letters to reiterate the above.